The Syrian coast remained calm (relatively) during the past six years, as protests were limited on specific areas before disappearing under the regime violent pressure and other factors, moreover, the zones out of regime control were limited near the Turkish boarders and reduced dramatically after the Russian intervention. The coastal areas did not participate in any opposing mobilization against the regime, on the contrary they sent fierce fighters to suppress the protests and were called later "the public foster of the regime" or "the regime base" as a metaphor of Alawites full support for the regime. The above mentioned, doesn't mean the utmost support for the regime or denies witnessing some protests in other area. This report addresses: the possibilities of more protests in the coastal areas - the factors that obliged locals to protest - future motivations for further protests – the factors of putting these protests down – the way that the regime dealt with the old protests along with preventing the potential ones – the security situation in this area to deal with the settlement implications upon those who sacrificed dearly (from both sides) in Syria – recommendations about a democratic national opposition. The coastal zone witnessed demonstrations in 2011, at first, in Baniyas followed by Sleibeh and Al-Raml Al-Janoubi neighborhoods in Lattakia after that, in Tartus. The demonstrations concentrated on Sunni areas with the participations of dozens of Alawites. Many Alawites activists (opposed and secular) tried to break the static situation, which was dominating among the Alawites, trying to do activities that break the regime authority, merging with the opposed mobilization and creating many rebel groups, which were tracked by Syrian regime security forces. In the Syrian coast, "Nahl Al Sahil" or "The Coast Bees" and "The Revolutionary Youth" are examples for these groups, as many of them faced death while the others fled. 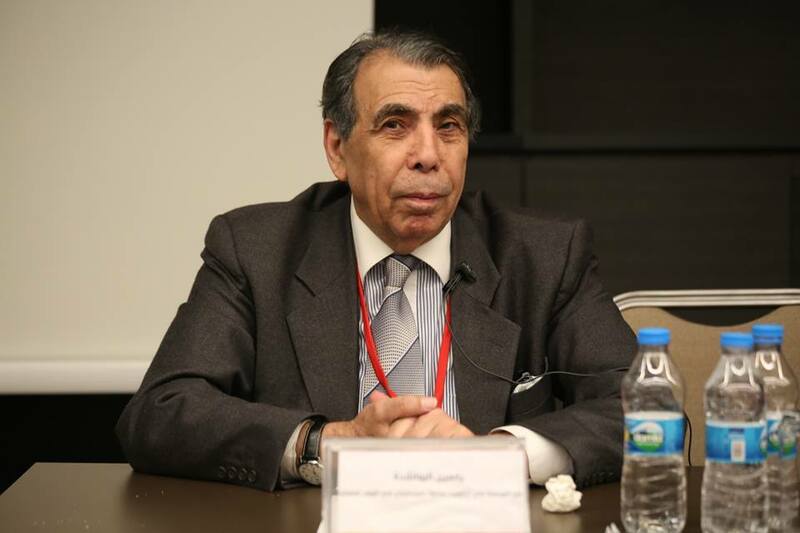 A meeting was held in Cairo under the name "We are all Syrians…..one nation for everyone", 250 opposed Alawites characters (well-known personalities) attended, seeking to delegitimize the regime as the protector of minorities, stressing that, supporting the revolution , is an ideal choice for Alawites. 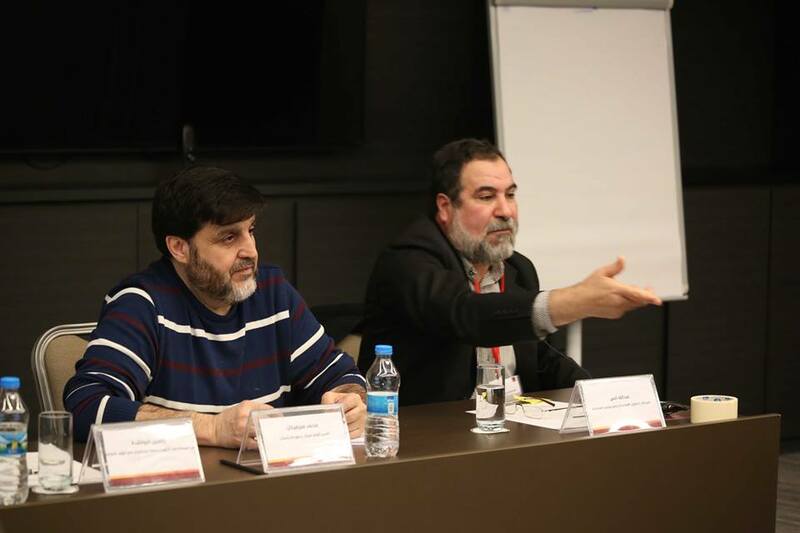 This conference was an important activity to show the community position, on 24/3/2013. On 3/4/2016, a document (with no names included) called "Declaring the Document of Fixing My Identities" denied any link between Alawite and Shite communities, stressing on their belief in freedom, equality and citizenship, calling upon a secular regime for all religions, confirming that, the regime legitimacy is based on democracy and human rights also, Alawites have nothing to do with the regime crimes, as they were existed in Syria before the emergence of Al-Assad father regime. On the other side, areas with Alawite majority witnessed supportive demonstrations, demanding the Syrian regime to use excessive force to suppress the opposing protests, threatening to destroy the country in case Al-Assad departed the authority! It started in 2015 and was timid in the beginning, as most of workers thought it wouldn't be fruitful. The main reason of this strike was the financial aspect and the dramatic rise in the prices comparing to their salaries, the regime gave many fake promises also, Al Ba'ath Party elements along with the factory managers accused these workers of treason in order to stop the strike, which was hard, forcing the regime to suspend the work whole factory after cutting all production outlets by workers, these protests included violent clashes with the regime representatives and denying the propaganda of treachery and conspiracy, as some of workers threatened (sarcastically) to join ISIS or HTS (Al Nusra Front previously) in case they were granted a firm labor contract. The protests ended with granting firm labor contracts to all temporary workers (who spent 15 years working in the factory). On 1/1/2016, Tartus witnessed an utter emptiness in the new garage of Tartus-Draykish, the strike started quietly and the regime security forces tried to forestall the situation by contacting them, giving promises. The strike main reason was, the shortage in fuel along with operating buses (related to a big business man) on the same route . The drivers turned back to work after providing the fuel by different mechanism, as oil and fuel are scarce in general, fuel tankers were providing the material for those drivers. Some transportation routes in the Syrian coast witness small protests by drivers due to the low porterage duty and the scarcity of fuel. Lattakia is located near Al-Assad place of origin, making it a place of entertainment for Al-Assad relatives, acting like everything belongs to them, making locals feel under threat at any time. This situation escalated after 2011, as Al-Assad authority grew larger in the city. Suleiman Al-Assad son of Hilal Al-Assad, National Defense militia leader in Lattakia, became one of the arbitrary symbols in the city. Suleiman's behavior became worse after the mysterious death of his father, represented by: trespassing private and public properties, sexual harassments and killing an army general in Al-Assad forces before his wife and kids, the last incident caused widespread protests in Lattakia, on 7/8/2015 . Within the supportive environment, protests took the escalating theme concerning the opposed discourse toward the regime, obliging the last party to break the prohibited policy (since Hafez Al-Assad reign) by detaining Suleiman Al-Assad and brought him to trial on 1/8/2015, moreover, declaring the situation through regime's media . A picket from families of Kuweires Military Airbase soldiers took place end of August 2015, lasted for few hours, as they lifted pictures of the besieged soldiers, demanding the regime to protect them while the fact was, these soldiers were used as a bait for the opposition forces. 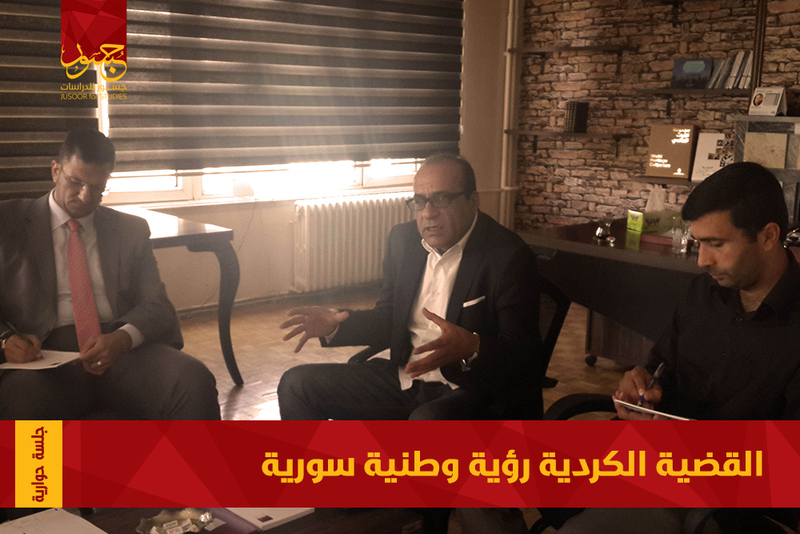 The sit-in ended peacefully as Tartus governor received a petition of demands, at which the carelessness from regime side, made the families to gather again in front of the governor's mansion, calling upon more effective participation and pressure. After that, more sit-ins about releasing the besieged soldiers along with setting free the captives took place, especially after breaking the siege of Aleppo Prison. The regime refused to conduct any negotiations to set its soldiers and officers free (even the Alawites), the prisoners exchange agreement was very limited with the supervision of external parties, which could be considered as a threatening issue. 2013 to 2015 has witnessed a dramatic rise in the death toll of Alawite soldiers, which has been reduced gradually by the Russian intervention. 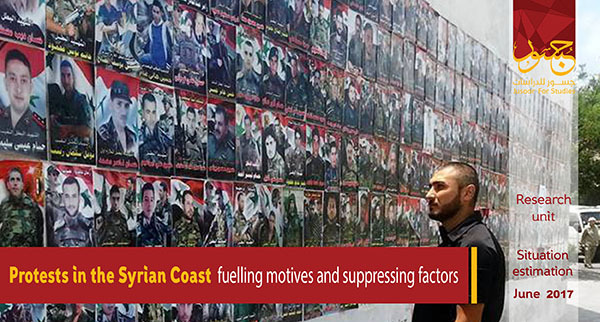 This loss has caused a clear gap among the Alawites in the coast, as the number reached 1000 which means 10 percent of males between 18 and 45 years old , the statistic doesn't include the injured or missing ones, moreover, evaluation studies on the regime soldiers (with their families) and combatants in general psychological impact, were not conducted while the total absence of the youth in the social, civil and work life could be exacerbated after the war. Despite the fall in the casualties among Alawites, the complaining and aversion was continuous because many families lost their own breadwinners without getting proper compensations or even sufficient supply. The regime narrative (a fight between the state and terrorism) was in doubt among the Alawites, as they preferred to participate in the National Defense militias to teach the terrorists an unforgettable lesson, which was obvious through the enrollment in these militias from unemployed Alawites youth at the beginning of the revolution, thinking that it was a great opportunity for them to gain money and power within a short period, however, Al-Assad forces defeat in many battles, affected the way in which Alawites regards the regime and a great deal of them ended in coffins. After the de-escalation agreement, the mistrust between the two parties took place. The National Defense militia in the coast faced an utter dissolving due to many aspects, like: deserting the military service – abandoning arms – evading the reserve service, turning the regime checkpoints into traps for them. Cases of theft spread among Alawites in cities and rural areas, as the perpetrators were gangs from The National Defense militia, some of the stolen properties were sold in public, like: Shadi and Nawras gang, which Duraykish locals suffered a lot, obliging the Syrian regime to use a great force to stop this gang, moreover, the aspects of random shooting and small conflicts along with tossing sound grenades among the militia combatants, are still existed. Different kinds of drugs have spread among youth, as influential figures in the state were trafficking them with full immunity also, gambling and lottery led to aversion from the Alawites toward the Syrian regime. These practices affected the state reputation (as the most safe and secure country), increasing the Alawites scourge. Comparing to 2011, function of the state can't offer sufficient income to the employee due to the 10 folds increase in the living costs, creating a huge gap between civil servants and army volunteers incomes, the thing that caused a situation of hatred toward employment and voluntary, which used to be a dream for Alawites, making them search for an independent source of income like livestock and private industrial sectors, causing a separation between employment (a step closer to unemployment) and good income. In the last years, any occupation is way better than the state function, yet, employees remain in their positions hoping to regain the function former situation (before 2011). Since 2011, majority of Alawites stayed away from that mobilization due to different factors: the way of addressing these protests by Hafez Al-Assad and his son especially against opposed Alawites – showing the opposed characters as aliens through religious and Al Ba'ath Party activities – politicizing the Alawite religion, which made Hafez Al-Assad and his son religious symbols, resembling to the situation in Iran. Many factors have broken these beliefs, which were already fragile due to the weakness of the Alawite beliefs and the secular regime's inability to deal with this religious context. The project gradual absence has caused the withdrawal of many opposed groups (with Alawite majority) from the Syrian opposition. On the other hand, the presence of Islamic groups especially the Salafist ones, created a deep rift among the supportive, opposed and in the middle characters. The regime stressed strongly on the existence of these groups, considering all opposed figures as elements for ISIS or HTS (Al Nusra Front previously), which found acceptance among its public foster in Syria and abroad. The armed violence was absence in the Syrian coast with more flexibility in addressing the different kinds of protests, moreover, the number of security elements remained the same despite the urgent need for more combatants in the regime forces, intensifying the security presence in the supporters' regions, employing Al Ba'ath Party elements, civil servants and teachers to convey security reports from different places as well. What mentioned above, made the idea of protesting with great numbers in the Syrian coast, almost impossible unless the number was very difficult for Syrian regime to handle. The indirect threat of Al-Assad regime toward its supporters started by the extreme Islamist alternative, as Al Ba'ath Party formed armed checkpoints on the entrances of villages and neighborhoods, spreading sectarian rumors about the existence of infiltrators and aliens with the aims of killing and terrorizing, which were increased by the presence of jihadist organizations. These factors led to the fear (among Alawites) of Al-Assad regime departure, considering that, any weakness within the regime forces would cause massacres, especially after the horrible sectarian slaughters from the National Defense militias against the Sunni regions. Some imams in Masyaf, Salhab and Al-Ghab issued a timid statement about naming the criminals. The Syrian Coast is witnessing almost entire emptiness of any active political organization, in addition to, cancelling any tasks of the trade-union bodies, working persistently to break through, corrupting and changing them into a security platform like Al Ba'ath Party, this process started since 1980s, at which Al-Assad security forces conducted arresting campaign against different parties. 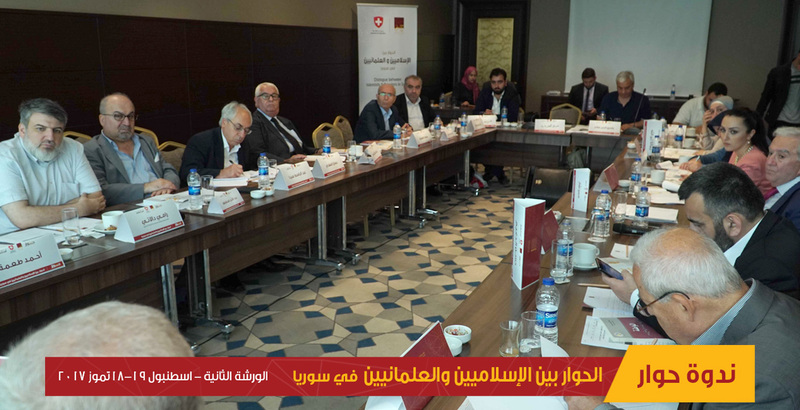 These parties tried to be reactivated in 2011, however, Al-Assad regime prohibited them or any other blocs from working in the Syrian coast along with detaining previous leaders in the left parties like Communist Labor Party. The current situation doesn't give any hope of widespread protests in the Syrian coast, whilst signing any settlement with the opposition, will deal a serious blow for Alawites after the considerable casualties and the fake promises from the regime of fighting terrorism and seizing all regions in Syria. "The fear of the other" is one of the Alawites current immobilizing factors, however, reaching a settlement would mean, the collapse of the regime propaganda and ideologies from the Alawites perspective, obliging the community to live in authority vacuum. The religious theme to be absent in any potential future protests in the coast due to the nature of the Alawite religion (Shite origin), focusing on the spirituality of religion with the lack of any legislations. Moreover, the religion went through a cut off (lost its teachings and texts) during the ottoman reign also, organizing a new sharia (after centuries of absence) is almost impossible, the thing that makes this religion as a mere relation between the person and the creator with few rituals and no prohibition or violating sharia law . According to what mentioned above, the protests will probably take one theme, the spontaneous one, that may find a proper environment to be organized and led by well-known and trusted Alawites' imams away from the religious nature because there will be huge contradictions among Alawites, leading to an utter failure.